Before taking any step make a backup of your current WordPress database. How to make a backup of your WP database? You can use different WordPress Plugins like Smart Backup and WP-DB_Backup. Alternatively, you can use phpMyAdmin. Smart Backup is a complete WordPress solution for database backup and restores operations. You can create backups of your complete WordPress installation, files only, or database only. Backups can be restored with one click. Hope you know where to run SQL Queries, If not follow these steps: Login to phpMyAdmin panel and select your WordPress database. After selecting your database, Click on the SQL tab which will bring you to a page with a SQL query box. SQL Executionner plugin provides an easy-to-use interface that allows you to run SQL queries directly on your WordPress blog dashboard. Super MySQL Terminal: Super MySQL Terminal is a PHP MySQL shell emulator. You can work with your share-hosted remote MySQL like your localhost. SQL Comparer – Synchronize your database versions: Compare and synchronize two SQL database schemas and see the difference between them. A beneficial tool when dealing with different versions of a database. SQL Document Generator: SQL Document Generator is a set of classes for creating documents in various formats based on SQL queries. 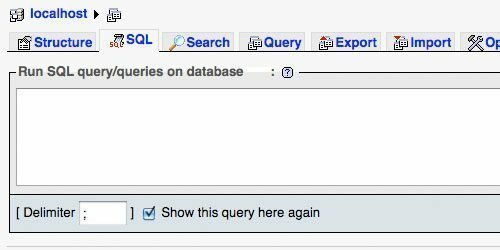 Enhanced SQL Web Console for MySQL: This script helps you helps you fire queries from the database and export the resultset with a browser on the fly. 1). Drag-drop to use, no setup needed. 2). Smart bookmark feature, you can bookmark your favorite scripts and pickup them to use anytime. 3). Export the query resultset to CSV , Excel, XML , HTML formats. 4). Read-only mode avoiding writable scripts executing. MySQL Database Navigation and Pagination: If you are working with hosting MySQL databases, and pick up data from them frequently, this script may make your life easy working with them. CreativeTable: CreativeTable it’s a PHP class that builds a table based on the data retrieved by an SQL query or a 2D Array. It has lots of options, and it’s very, very configurable. LogPress: This plugin will help you to debug and speedup development of WordPress plugins and themes. Besides logging PHP error it can log a bunch of other things to help you make your website better. What to do if you lost your WordPress password? The easier is to use PhpMyAdmin and execute a simple SQL query to update it. Here’s how to proceed. Some bloggers makes the mistake to write their first posts under the name “admin”, until they realize that it’s absolutely not personal. But then, modifying author attribution on each post takes a lot of time. Happilly, here’s a recipe to batch modify author attribution. Post revisions are very useful, especially in the case of a multi author blog. However, the problem of post revisions is definitely the number of database records it creates. Best way install Akismet! if you want delete more than 6000 spam comments by using this command of line. In a WordPress database, if you run a query to delete old posts manually from MySQL, the old tags will remain and appear in your tag cloud/listing. This query allows you to identify the unused tags. This tip isn’t specific to WordPress and is a must know for anyone who’s working with MySQL databases. Over a period of time, your blog will have received many comments. These comments will include the email addresses left by the commenter. You can retrieve all these emails for your mailing list without any duplicate. Sometimes, for exemple when you have to upgrade your blog, you need to disable all your plugins. Depending to how much plugins you’re using, it can takes a lot of time and be kinda boring. This piece of code will remove all tags and relationships between tags and posts, while leaving categories and taxonomies intact. The following query will show you all the records in the postmeta table that doesn’t have corresponding records in the post table. This code will automatically close comments on posts which are too old. This SQL query will close comments on all posts published before January 1, 2009. This SQL query easily replace the old url by your new site url. Simply run this query and you’ll be done! This query will replace the email address provided in the comments field, by a new one. The following query will delete all comments with a specific url. The “%” signs means that any url containing the string within the % signs will be deleted.